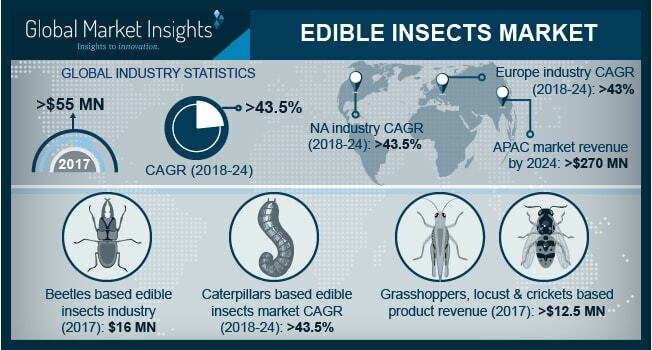 Edible Insects Market size is set to surpass USD 710 million by 2024; according to a new research report by Global Market Insights, Inc. Growing consumer awareness pertaining to various health concerns and shift in trends in consuming protein rich foods, should drive edible insects market size. Invertebrates have a vital role in plant ecosystems and minimizes cardiovascular diseases risks, thus propelling the industry growth over the forecast timeframe. Edible insects produce less emissions during production process and require less water which act as sustainable source. The products are used in wild harvesting and semi-domestication farming practices owing to its organic properties which in turn enhances the individual and industrial farming techniques, thus increasing the product demand. Increasing sports & dietary supplements consumption by sportspersons & athletes owing to presence of protein, vitamins, and amino acids will drive edible insects market demand. Stringent government norms regarding fishing and decline in seafood resources will enhance product demand. Asia Pacific driven by Vietnam and China edible insects market size, should exceed USD 270 million by 2024. China and Thailand are regions where insect feeding is routine, due to large number of invertebrate farms and are accepted as dietary substitute, thus enhancing product demand. Increase in medical application owing to health benefits along with shifting consumer preference towards packaged edible insects in BBQ or raw forms is likely to fuel market demand. Growth in raw material, transportation and set up cost may hamper the small-scale production of edible insects, thus hindering the industrial profitability. The production process requires highly skilled labors and lack of knowledge about bugs habitat may hamper the insect growth which in turn act as a market hindrance. Edible insects market size from snacks applications may exceed USD 240 million by 2024. Cricket based protein products are used as healthy snacks as they reduce saturated fats and carbohydrates. Grasshoppers are sold in markets as snacks on roadside. Snacks are high in protein, zinc, potassium, vitamin, amino acid and calcium which may further stimulate industry growth. Bees, wasps & ants based edible insects market size may witness a significant growth of over 43.5%. Consumer awareness regarding health benefits and rising application in food industry has led to increase in product demand. Adult bees are often roasted and grounded into a nutritious flour. In China, ground bees are used for medicinal purpose mainly to cure sore throat. North America led by the U.S. edible insects market size may exceed USD 80 million by the end of foreseeable timeframe. FDA has also confirmed that consumption of crickets and mealworms is safe and act as natural protein source to consumers. Increasing product demand in various dietary supplements farming applications have fostered market growth. Rise in automation techniques used for harvesting, rearing and processing will bolster product demand. Out of 2,000 species globally, 90 are used as food supplements in the U.S. and are accepted as natural food product. Scale insects & true bugs based edible insects market demand will witness a steady gain at over 43.5% by the end of projected timespan. Marchalina hellenica, scale bug is mainly introduced in Turkey and Greece to increase honey production and hence will increase the food source demand congruently. Carmine, a red dye produced by scale insect is used to color foods, textiles and pharmaceuticals, thus promoting industry demand. Edible insects market size from flour applications is likely to surpass USD 230 million by 2024. The products are rich in omega 3 fats, iron and high protein and cricket flour is chiefly used due to its gluten-free characteristics, thus driving market demand. EnviroFlight, AgriProtein and Haocheng mealworm are key operators in edible insects market. Strong R&D spending by manufacturers in order to fulfill with various environmental guidelines may advance product portfolio thereby stimulating industry growth.